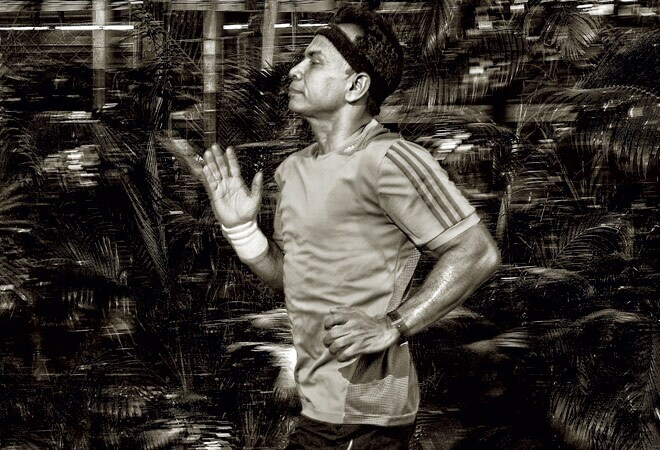 Sanjay Tripathy, Senior Executive Vice President, HDFC Life on his passion for running marathons and his training regimen. In the modern-day corporate world, a successful man is one who has no time for anything else. By that definition, Sanjay Tripathy is quite the aberration. As Senior Executive Vice President for HDFC Life, he handles marketing, product, digital and e-commerce. He's a busy man but despite a hectic work schedule, he puts on his running shoes a minimum of four times a week. In an exclusive conversation with BT More, he talks about his drive for fitness and running and his zest for participating in multiple marathons. I had a near-death experience in a road accident 11 years ago and that changed my life. I decided to give running a shot to regain my confidence when I came across an advertisement for the first Standard Chartered Mumbai Marathon (SCMM) in 2004. That was the beginning of my love affair with running; I have been at it for over a decade now. I have always preferred running outdoors as I run to breathe in fresh air. On a treadmill, the belt moves under you and there is no wind resistance for your body to counter, so it is easier to run. It also doesn't teach you how to find and maintain a pace on your own. Three days a week I train with my running group 'Be Fit' at Shivaji Park, Mumbai. The routine changes every time and we do a mix of running, interval & speed training, strengthening, core workouts, resistance & endurance training. The remaining days I go to the gym for cross-training, cycling, weight training, yoga & pranayama. With summer here, I will add swimming to the routine. I run an average of 25 -30 km a week. Weekdays I run between 5-7 km and on Sundays I go for a longer run. The intensity and distance goes up as I get closer to a marathon or any running event. Running as a whole is challenging as our body naturally imposes limitations, both physical and mental when it comes to the distance. This is where marathons help, as you push yourself beyond those limits. I started with a dream run of the first SCMM. I have been running the 21 km SCMM half marathon for over 7 years now. I ran the Thane half marathon this year and will do a few more this year itself like the ones in Satara and Delhi. During practice the maximum I have run is around 25 km. My best time was the Thane marathon this year when I completed the half marathon in 2 hours and 6 minutes. The training plan for a marathon gradually builds every week. During weekly long runs, I focus on covering the distance for the day, and forget about pace. Along with that, I do weights, cross training, endurance training. I have also joined a running group and follow a comprehensive fitness and diet regimen as advised by the coach. The trio of carbohydrates, proteins and fats is essential for a marathon runner. Potatoes, beans, peas, wheat bread, bananas, cereal, raisins, apples, brown rice, which are rich in carbs are necessary. Proteins like milk, cheese, yoghurt, and eggs help in muscle repair. You need a balance of protein and carbs on rest and low-intensity training days. On normal moderate-intensity training days, increase of macronutrients will help muscles recover. While running, your body depends on primarily glycogen as sources of fuel. By increasing carbohydrate consumption in daily meals, you increase your glycogen storage, thus, adding fuel to your tank. I try to balance my carbohydrate and protein intake, based on my training intensity and have oats and banana an hour before my run to help maintain glycogen storage. Within 30-minutes after each run, I have carbohydrates and protein to help my body recover. Set a running goal, read up on proper techniques to avoid possible injuries and add weight training to your fitness routine. It's also important to stick to a runner's diet, hydrate well and have a good support group.